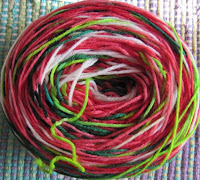 A few days ago I told you about the watermelon yarn that I bought. Yesterday I wound it into a cake and knitted up one of the large blocks and one of the small blocks of my sock yarn afghan. 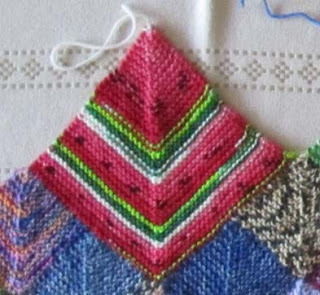 It's meant to form a watermelon design when you knit a pair of socks, presumably in stocking stitch and with at least 60 stitches, or so I am thinking. I wasn't sure how this yarn would turn out when done in garter stitch and continually decreasing until all the stitches are gone. As you can see, the watermelon-y appearance is still there regardless of the size of the block. I couldn't be more surprised or pleased. 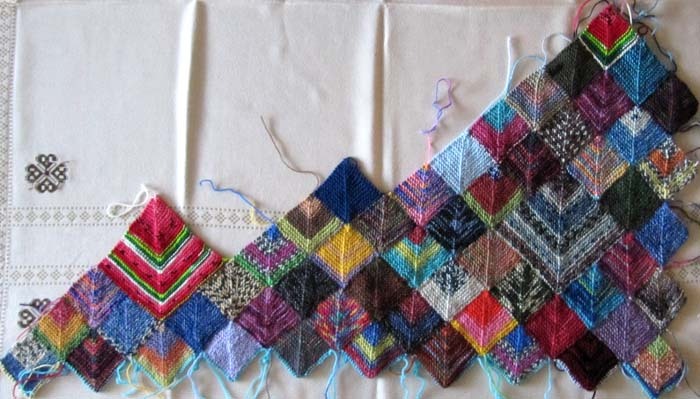 The afghan's current count is 53 small blocks + 2 large blocks. I haven't yet decided on how wide I want this to be. I'm working randomly across both the width and the length. I received a box of Amy's leftover sock yarns and I really appreciate it. I'd like the afghan to contain lots and lots of colors and patterns so I'm very grateful for the help. Thank you, Amy!! I was curious as to how much yarn it took to make one of the small blocks, so I knit one and then unravelled it. I measured, without stretching the yarn and it came to about 23 feet, just under 8 yards. That's a very small ball of yarn, perhaps about the size of a cherry tomato. I've woven in all the ends for the blocks that are "landlocked". Any that are on the edge might be needed later, so I'll leave them until the border is worked. My enthusiasm for this project hasn't diminshed. As a matter of fact, it grows as more blocks are added. Thank you for giving a heart to my sockyarn blankie! 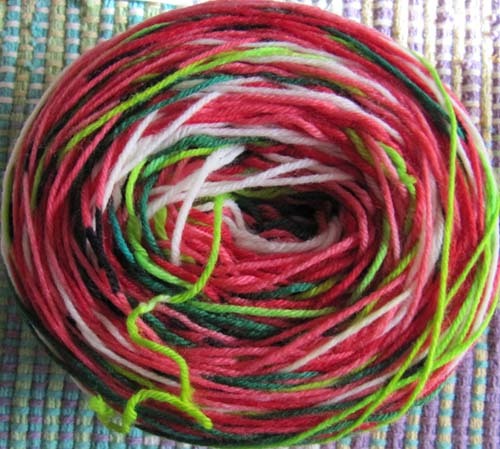 I love the watermelon yarn! It really goes well with the shapes of the rows in the diamonds. Oh my, that's a lot of ends to weave in. I don't think I am going to tackle modular knitting any time soon.